I got a new Lazy Lady wheel for spinning on the couch. Want to see? -retails for $655-please note that this was an August 2007 price-at The Woolery and up. My wheel came straight from Majacraft in New Zealand by airmail and arrived in about a week. It was well-packed in a cardboard box with lots of foam board and New Zealand newspapers. Assembly instructions are easy to follow. 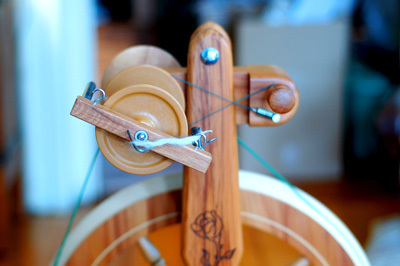 This wheel is suited to spinning most any kind of yarn right out of the box, but if you like to spin gigantic yarn or very fine yarn, you can get any number of attachments to get you there. There’s a high speed whorl that will get you ratios of 14, 16.5, 21 and 28 to 1 for around $21 and a wild flyer with very large orifice and ring. A plying flyer/bobbin set is also available and it’s a big one. A separate fast head is available that gets you ratios of up to (an inadvisable) 46:1. A lace kit is also available, which includes fat core bobbins and lace flyer There’s one brilliant thing I noticed straight away- the way the head is built, you can use any flyer or bobbin with any whorl. This is not the case with many wheels, where the size of your flyer and/or bobbin narrows your available ratios. Here’s a list of all accessories available. The wheel, bar the drive wheel, which is MDF, is beautifully made from wonderfully patterned Rimu wood, which is native to New Zealand. Though it’s classed as a hardwood, it’s not the hardest wood I’ve met, so care should be taken not to bang the wheel around a lot. The finish is gorgeous, however, and the care instructions state that any ding can be disguised with a drop of furniture oil or polish. 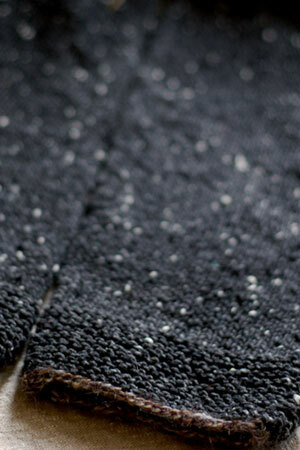 All movement, including treadling, is smooth, easy, and silent. There’s a slight whir from the bobbin, but that is it. The bearings are the sturdiest I’ve seen, and they’re sealed, so no need for oiling. The flyer can take a dab of Vaseline every now and then to ensure smooth turning of the bobbin. That’s it! The wheel is quite heavy and stays right where I put it with no shimmy, shake, or wobble. It stands very firmly on four rubber feet. Everything feels very sturdy and well-made. With the loosening of a knob, the wheel fold at the center so that the flyer moves down near the treadles and a handle pops up for carrying. Very handy! Bobbins hold approx. 6 oz. and are plastic and boilable, meaning you can set the twist in cotton or put it straight into a dyebath. I was a little put off by the appearance of the bobbins, but they’re made and work well and are inexpensive (it didn’t give me a heart attack to purchase 8 of them), so I’m pleased. Majacraft makes wooden bobbins, as well, if it’s a concern. Both whorls have a range of ratios from high to low. One was designed to go with each flyer, but either will work with either flyer. The whorl is attached to the flyer rod behind the head with a screw and Allen key. The flyer is un-screwed from the flyer rod at the front for bobbin removal. The flyer rod stays in place at all times. I’d sworn off Scotch tension and still bought this wheel, so that should give some indication of how much I liked it when I tried it. The tensioning system on this is a little different than any Scotch tension I’ve used before (Ashford, mostly). You can see in the photo above that the string is crossed. This results in the tensioning spring producing the same drag at all times. You never see the spring stretch or bounce. There is no jerking to the tension at all. It’s also easyand smooth to adjust with a lovely big wooden knob. If all Scotch tension felt like this, I’d have been more open to the wheel a long time ago. Spinning is smooth and nearly silent at all speeds. The drive band is stretchy and a little rough, so it grips everything well. The bobbin box/lazy kate holds 3 bobbins. It’s not tensioned, so I might replace it at some point with one of Majacraft’s tensioned models. All in all, this is a great wheel for any spinning I can imagine doing. Even though it folds, I would not consider this a great travel wheel due to its weight (15+ lbs., according to my bathroom scale) and size. It can certainly travel in a car, however. This wheel is pretty much as good as it gets. I can’t imagine it limiting me in any way. 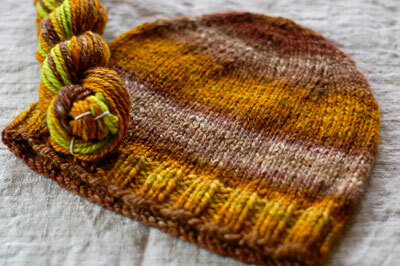 There really will be a shop update today at 2pm EST, with just Hello Yarn yarns and fibers. Sarah of Maisy Day Handspun is furiously getting ready for Oregon Flock and Fiber. If you’re in that neck of the woods, you should visit her booth! Today I’ll have hand-dyed Sock, Fat Sock, and Single Color Lace skeins, including the most difficult to photograph blue Fat Sock ever made. :) There’s also hand-dyed Merino and BFL wool fiber. BFL is great for new spinners, so I’ll make those available as spindle kits, as well. 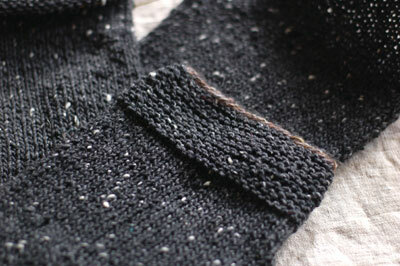 After this update, I’ll be concentrating on getting the fiber club out and getting ready for Yarn School, which is so very soon. 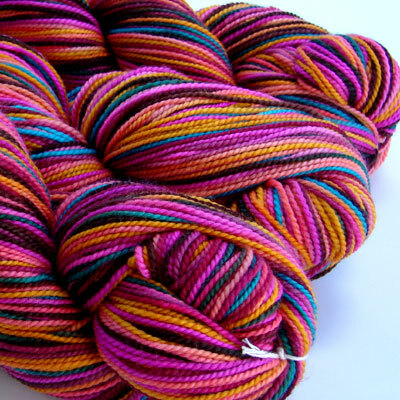 When I’m back, I’ll be dyeing up a whole bunch of yarn in all of my new yarn bases. A box big enough to hold two adults showed up last night and boy, was it filled with soft gorgeousness! Shop away at 2 pm EST. See it all on Flickr.